The interactivity is most recent trend in Web Application Development. To attract more visitors to any Web project owner should offer more interactive services like subscription, voting/polls, forums, comments, … One cannot deny that such a interactivity where visitor can enter a data, increases the vulnerability of the web project. Your website may fall a victim of brute-force attack, automated data injection through your forms, SQL injection, … Easiest solution to avoid such problems is to use Captcha. Captcha helps to make sure that only humans perform certain actions with your website, protecting it from spam bots (software). It prevents abuser from injection of vast number records and spamming your system. Because of the similar reasons I’ve decided to develop my own captcha. As a result you can see following code of very simple and small, but at the same time enough robust and flexible Captcha. You can define any length for Captcha string as well as the type of string: numbers, chars or combination of numbers and chars. It can be easily used just by following to the short instructions. Include this code just before proceeding the data you get from form. 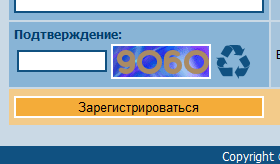 It verify the captcha image with value entered to cahtcha input (reg_captch).